Sophie, a young milliner, encounters a wizard named Howl on her way to visit her sister Lettie. Upon returning, she meets the Witch of the Waste, who transforms her into a ninety-year-old woman. Seeking to break the curse, Sophie leaves home and sets off through the country. She meets a scarecrow, whom she decides to call 'Turnip Head'. 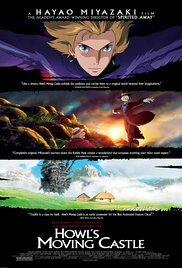 He leads her to Howl's moving castle, where she meets Howl's young apprentice, Markl, and the fire-demon Calcifer, who is the source of the castle's energy and magic. When Howl appears, Sophie announces that Calcifer let her in, and she has hired herself as a cleaning lady for the house. Read more on Wikipedia.